Anthony and Alyssa Neff visiting the Museum, July 12, 2013. Photo by the author. From a husband and wife married nearly fifty years to a couple recently engaged, this week’s three conversations are all about pair experiences at the 30 Americans exhibition. Anthony and Alyssa Neff are father and daughter visitors from Menomonee Falls, Wisconsin. Anthony is an accountant while Alyssa is a student at Savannah College of Art and Design (SCAD) studying Fashion Design in Atlanta, Georgia. 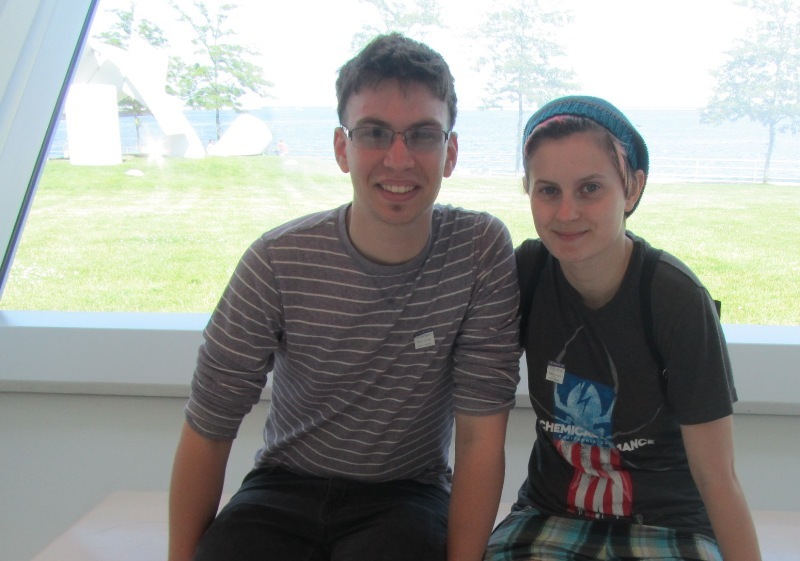 They took advantage of Anthony’s day off as an opportunity to visit the Milwaukee Art Museum. Anthony: It was much better than I thought. I thought it was going to be one medium, but it was various mediums with a lot more challenging questions… I enjoyed it quite a bit. Alyssa: I completely agree… I love the title, that’s it’s 30 Americans because I feel like in America, “African” always comes before “American.” To see this exhibit as “30 Americans,” it was good to see it in the light of “this is American culture,” it’s a part of American culture… I feel like in America, especially in history in grade school you learn about the revolutions, the civil wars, etc, etc. However, you don’t cover the different minorities that play such a huge role in American history. You don’t talk about the… African-Americans very much, or the Mexican-Americans... It’s like, yes, I am from this continent; however, America for me, that’s my culture. That comes before the African part… its just so many different cultures that contribute to “America,” but so many of those are just disregarded as different entities. Anthony: Come, yes I’d tell them to come. Also, take some time out. If you… get the extra audio, you get a lot more information than you would not have gotten if you only reading the panels of the artist… That’s very, very helpful. Especially the Nike Cave sculptures, those are just fabulous. I wanted to take a couple home with me – I bought a postcard of one… It was outstanding, come! Alyssa: I would definitely say, “Come and get the audio if you don’t already have the background on these artists.” Because I’m in art school, so I already have the background on some of these artists… And then take your time. I saw so many people rushing through the exhibit. You have to take the time to read and really understand what the artist was thinking… You have to get into their mind to get the image that they are trying to portray. Anthony: The work of Kehinde Wiley… I think his take on classical pieces was just outstanding. Some people may not like the idea that he did it, but I like the way he tried to transpose modern people to these classical pieces of work. It was a brilliant idea. There were a few brilliant ideas in there, but his work was probably what I liked the best. Alyssa: I loved Kara Walker and Carrie Mae Weems. I just loved how they took images that were supposed to be so gruesome and kind of humanized them… With the photography, especially Carrie Mae Weems, she made it so that these are no longer… just on selling blocks, but rather actual people that you could see everyday. With Kara Walker, she made… a gruesome storyline come to life. David and Sharon Middleton visiting the Museum on July 12, 2013. Photo by the author. David and Sharon Middleton are retirees from Franklin, Wisconsin. They will be celebrating their fiftieth wedding anniversary in two weeks with a lengthy excursion to Alaska. Prior to their retirement, David Middleton worked at the Milwaukee Journal Sentinel on the business-side in transportation and circulation while Sharon Middleton held a position with the Milwaukee Chamber Theatre. David: I was quite struck by it for a number of reasons. One of them was that so many of the art pieces used materials that I am not accustomed to seeing – collages. Things I would never think of using myself or know how to use. But, the other thing is that I have been unaware that there was so many fine African-American artists that we normally do not see in museums. Sharon: I just loved [Nick] Cave. David: Expect to be surprised and stunned. I mean some of the coloring and things were so well done. You know, it’s a sad commentary in many cases on the history of our country. It is not going to go away, so the best thing is to embrace it. Well, what did you think about the fact that his works are faceless? Sharon: Oh, I liked that. David: One of the artists I remember is Glenn Ligon. I read all of it – well I did that with all of the artists – but especially with his because it seemed that he was struggling so hard to really put forth some ideas. I began to appreciate what he was saying and doing even though it is not my experience. Did you also appreciate the struggle because he is, in effect, struggling to showcase struggling? So he must have been pretty successful to make you identify with him in that way? Sharon: I’m taken with Duck, Duck, Noose [by Gary Simmons]… It’s just that you never knew quite when it was going to happen to you. Alexandrea Lenz and Matthew P. Hill visiting the Museum on July 12, 2013. Photo by the author. Alexandrea Lenz and Matthew P. Hill moved last October from Burlington to Milwaukee, Wisconsin. Following their relocation, they became engaged to be married. 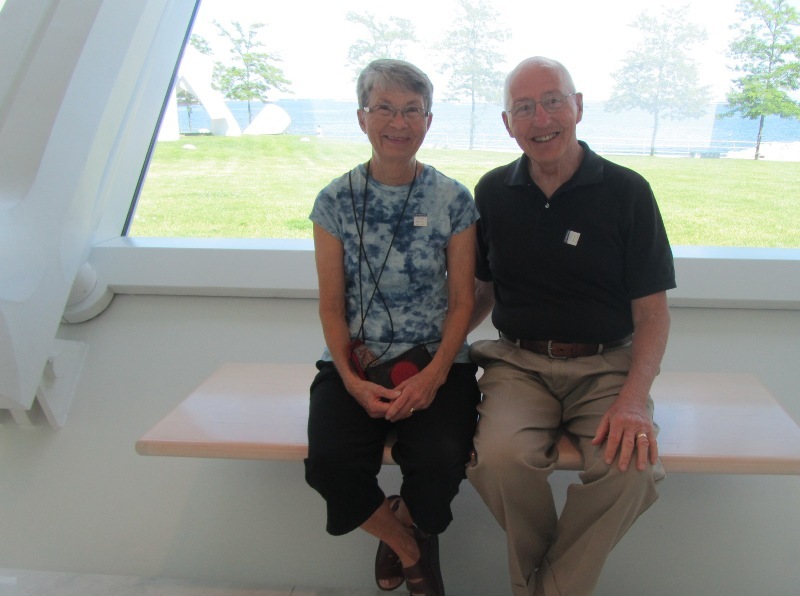 The couple are members of the Milwaukee Art Museum. Alexandrea Lenz is a student at UW-Milwaukee for Biochemistry and works full-time. Meanwhile, Matthew is a Patient Care Assistant for the developmentally disabled. During their leisure time, Alexandrea shoots digital photography while Matthew paints in acrylic and watercolor. Matthew: My first impression was that it was very colorful. When you first walked in the door you see all the different colors and stuff so it was kind of cool. I liked the abstract feel at first too. There are a lot of different pieces, so it kept my attention. Alexandrea: My first impression was of kind of like, “hmm, interesting” – some of the pieces lost me a little bit, some of them I thought were really cool. I’m always that way. He [motions to Matthew] likes more of the abstract. I’m more into conceptual photography and stylized stuff… I liked all of the color and stuff too though, and I liked a lot of the patterns. It made it a lot more interesting visually. Alexandrea: I would say, just be very open minded and willing to really look into what they are trying to say. For us, it might be kind of hard to understand at first what they are saying because of the background of a lot of it. But, try to be open minded about it… when it might be something that is very different from what you would normally think about. Matthew: There may be times when you are like, “Oh!” You take a step back because something takes you by surprise. Then, you read about and realize why they may have done that. So, the art is educating you? Alexandrea: Yes, it’s making me think outside of my normal box… Some of it, when I first walked up, I was like, “I don’t understand this.” Then, I really looked into it was like, “I feel uncomfortable in a way.” But, then I was like, “Well, it’s good to feel uncomfortable because that is the point…” You look at it and go, that’s uncomfortable, but you know that the purpose of the art is to make you think about it in that way. Matthew: The people who have made [this artwork] are obviously very passionate about what they are feeling… and it really shows. Matthew: Whore in the Church House [by Mark Bradford]. I liked it because it kind of looked like a map and then it looked like there was lots of different pieces put together at the same time. It’s looks like a collage… It caught my attention because it was so different from anything else. Alexandrea: I really liked the one of the guy in the normal street clothes on the horse [Equestrian Portrait of the Court-Duke Olivares by Kehinde Wiley]. It was made to look like a classical painting. How he was galloping into the wallpaper – I thought that was really cool. I like the meshing of the two styles, bringing the new in with the old. In a way, it was amusing too because at first I laughed when I saw it. But then when you look at the detailed work and all the actual talent that the painter has, it’s so cool when an artist is extremely talented and, at the same time, has a great sense of humor. So, what do you think of transmuting a new, graphic artistic style upon such a traditional format? Alexandrea: I think it is really cool because when you think of the entire theme. A lot of this [exhibition’s artwork], in my point of view, has to do with racism. When you think back in art history, whom do you see in art books and in art? So, I think it’s really cool that they get to now take that and put who-ever they want in that role, instead of just all white people. Anyone could be the man on the white horse. Alexandrea: Right… He was all in urban clothes and… [the artist] didn’t have to make him a certain type of black person… He didn’t have to be wearing a nice suit or something to be up there [in the painting and on the horse]. Check back next week for 30 Encounters with 30 Americans: Conversations IV – VI. 30 Americans is at the Milwaukee Art Museum from June 14 through September 8, 2013. For more information, please click here. 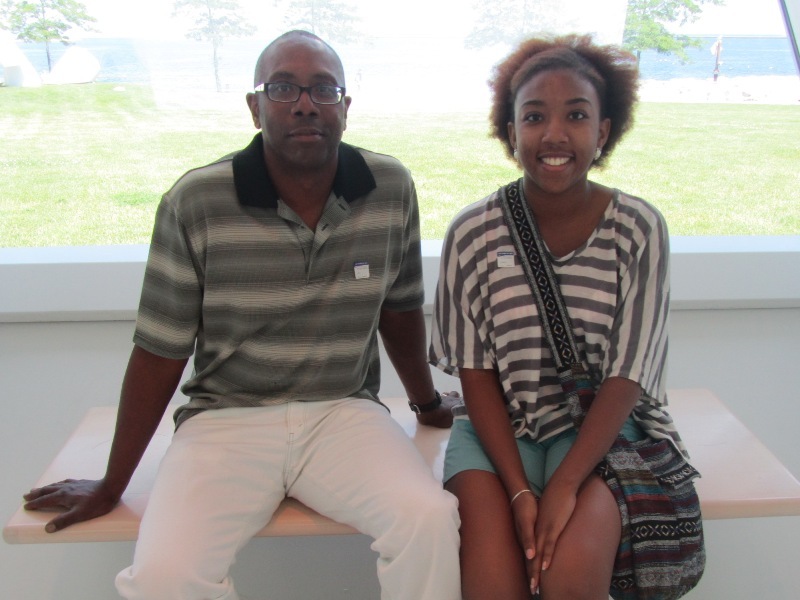 Quote | This entry was posted in Art, Curatorial, Exhibitions and tagged 30 Americans, 30 Encounters with 30 Americans, African American Art, American Art, Contemporary Art, Conversations, Exhibition, Milwaukee Art Museum, Weekly. Bookmark the permalink.